Maya Restaurant in Bangkok wows from the moment the elevator doors swing open on the 29th floor of the Holiday Inn Hotel. Serving traditional Indian food presented in a modern fashion, alongside some of the tastiest signature cocktails and mocktails we have tried, this smart casual restaurant is a pleasant surprise. The restaurant is open every evening from 17:00 until 01:00. 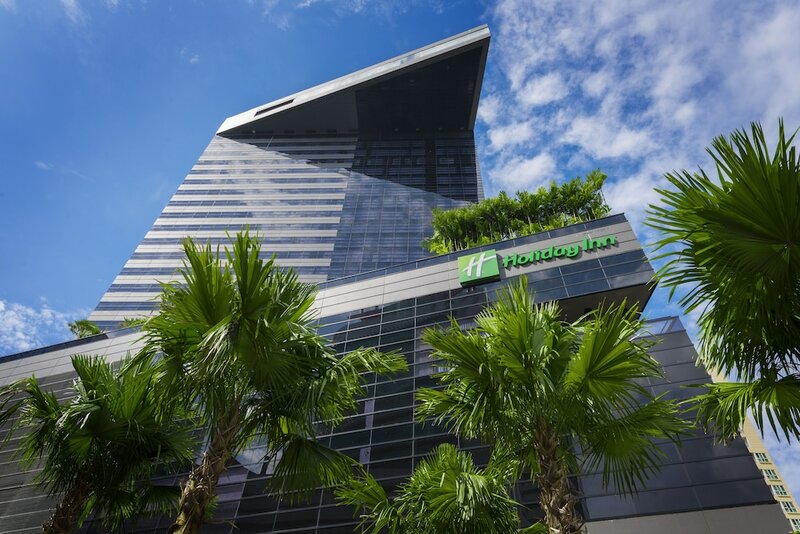 Holiday Inn Sukhumvit 22 is located between Asoke and Phrom Phong, but if you are coming on the BTS skytrain we recommend getting off at Phrom Phong as it’s just slightly closer in terms of walking distance. Take the lifts on the right hand side of reception, which take you straight up to Maya restaurant. The first thing you notice when walk into the restaurant is the open kitchen. Behind glass are three copper tandoor ovens, blasting out an impressive heat. The look here is extremely polished, with liberal use of black and gold and large windows so you can appreciate the Bangkok cityscape. The restaurant is split into three zones, an outdoor balcony, dining room and a lounge bar. Easily the most unique area of the restaurant, the lounge projects stunning photographs and paintings onto the ceiling, the marbled onyx bar is an impressive centre point with the city stretched out behind it, almost like you are floating. Although you cannot see it from inside, the bar is cantilevered, meaning it hovers over the city, supported only on one side. Every evening a DJ spins a mix of chilled out tunes and Bollywood classics and the atmosphere is relaxed and convivial. Ladies night is one of the weekly highlights offered by Maya restaurant. Every Wednesday from 17:00 until 22:00, the restaurant serves free prosecco until you’ve had your fill of bubbles. We recommend ordering from the snack menu to accompany your flutes. The rest of the week make the most of the excellent two-for-one happy hour, which runs from 17:00 until 20:30 every evening and includes cocktails, beers and standard spirits. The signature cocktails are remarkably creative. The Kachumber (295 baht) cooler is a blend of gin, cucumber and cilantro, refreshing and not overly sweet. Another unusual mix is known as That’s the way I like it – fresh mango baked with cumin and muddled with vodka. If you’re laying off the booze I recommend an apple pomegranate colada (220 baht), served in a martini glass. The blend of apple, coconut milk and pomegranate seeds is topped off by a fan of thin slices of apple and almond. The menu is impressive, with a good range of chef’s specials, tandoor cooked treats and vegetarian delights. It covers the classics that you know and love from Biryanis to kebabs, with a focus on northern Indian dishes with a twist. As soon as we sat down the friendly waitress served a large bowl of poppadums with five different kinds of relish. Indian food is best enjoyed in the same manner as Thai, so we order a couple of starters to share, a large portion of paneer tikka (340 baht) in two different varieties: yoghurt and Peshawari spice filled and saffron infused soft cheeses. We also selected chicken from the tandoor, marinated in yoghurt, cardamom and mace, finished with flakes of edible silver (380 baht), a rich and medium spiced dish that left you wanting more, despite the large portion size. For our mains we explored the vegetarian menu with the signature dhal Maya (250 baht) a hearty mix of black lentils, tomatoes and garlic with a swirl of butter still melting on the top, and a cashew nut bhindi (320 baht) – a colourful curry made with crispy okra and sharp mango powder. As recommended by the friendly chef, we also ordered the lamb chops grilled in Peshawari spice, cinnamon and malt vinegar (850 baht). What helps the restaurant stand out is their use of non traditional meats, like scallops, duck and salmon. There’s an impressive selection of breads and accompaniments too. Be sure to leave room for the desserts. We tried the dark chocolate terrine (200 baht), sprinkled with pistachios and with a refreshing coconut centre. Another great option is the gulab jamun cheesecake (200 baht), mini deep fried dough balls are baked into the cake and tickled with rosewater scented syrup. Maya restaurant is just perfect for a leisurely meal with excellent food and a friendly atmosphere.